The "OZONE GUN DEVICE" is designed for ozonation of industrial and agricultural facilities, technology and production facilities of poultry farms, livestock and meat-processing plants, refrigerators, milk and cheese factories, catering, pharmaceutical companies, vegetables and fruit, in the processing of grain before storage and pre-treatment with the purpose to sterilization, disinfection , deodorize, destroy viral infections and pathogenic bacteria, improve safety and increase-term keeping of, removal of hazardous and toxic substances, odors, toxic substances and disease prevention, to kill rodents, larvae worms. The "OZONE GUN DEVICE" refers to a class of gas-discharge electronic equipment and is the device for electrosynthesis of ozone from the air as it passes through an electrical discharge. The bactericidal effect of ozone is much stronger than quartz ultraviolet irradiation. The bactericidal effect of the quartz irradiation for 60 minutes is equal to bactericidal effect of ozone within 3 min. Ozone has a bactericidal effect on the golden staphylococcus, pseudomonas bacteria, germ theory of disease of cholera, typhoid, dysentery, plague, influenza viruses, hepatitis, AIDS, tuberculosis and others. Ozone has a high penetrating power and a bactericidal activity against gram-positive flora, E. coli, Staphylococcus epidermidis, and inhibit the growth of mold and other fungi. Sterilization and disinfection of large industrial and agricultural premises. Creating a healthy atmosphere in the room, recreating the processes occurring in the nature. Cost savings in the procurement of antibiotics, chemical disinfectants and energy resources, while using ozone treatment, heating of objects is not required. The ozone generator is a modular unit of 100 German quartz tube once - in-line chambers with metallization. When a high voltage up to 12 kV, with a high frequency current to the ozone generator, it is produced a multiple high- dielectric barrier electric discharge (plasma). When the air passes through the burning plasma (up to 1000 ° C), it is produced ozone - air mixture. To activate and control the operation of the device, on top of the front panel there is a display with color indicators, automatic fuse and power key cooling fan, ozone pressure centrifugal fan and ozone generator. The centrifugal fan is supplied the air through the filter into discharge chambers with a maximum capacity of up to 495 m³ / h at a pressure up to 400 Pa.The timer is set from 0.0 to 180.0 minutes. In case of breaking modes such as a breakdown in the discharge chamber, a deviation of the voltage or current strength over admissible level, ozone generators turn off automatically, the indicator light is on and fans are cooling the power supply. High-performance, versatile, universal and ecologically safe method of sterilization and disinfection of a new generation. Warranty repair is 1 year and service is at least 10 years. Guaranteed and fast processing of agricultural facilities, medical, industrial and food premises etc. Completely ready to work, requires no installation work, no special water cooling or three-phase voltage. Requires no service, simple and reliable in operation. Produces the maximum amount of ozone, electricity consumption is 30 % lower compared to other manufacturers. Dimensions and the size is at 3 ÷ 4 times less in comparison with other analogues in power. The lowest price among similar installations in power consumption. "OZONE GUN DEVICE" on wheels and with handles. The ozone generator has three modular units consisting of 30 German quartz tube discharge chambers with metallizing (chambers have a larger diameter). The top has a display with color indicators and keys of turning on a fan with three levels of the discharge chamber. Air supply to discharge chambers is made by the high capacity fan up to 655 m³ / h. Hours of work you may adjust changing the timer from 0 to 180 minutes. The ozone output is up to 200 gr per hour with a power consumption of 0,8 kW. 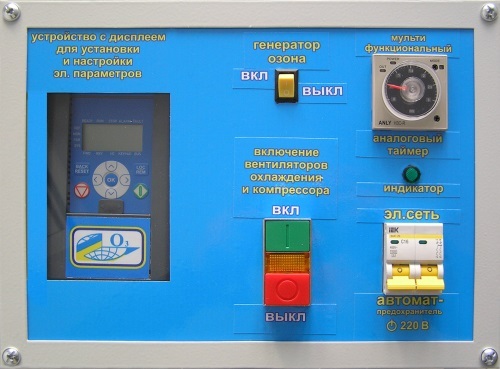 In case of breaking modes such as a breakdown in the discharge chamber, a deviation of the voltage or current strength over admissible level, ozone generators turn off automatically and the red indicator light is on. 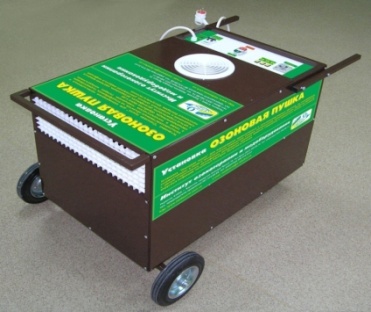 The "ozone gun device" consists of a metal unit on wheels, which includes: electrical power unit, control systems and automation, control unit with keyboard, power modules ozone generator blocks with discharge chambers, a fan providing airflow through discharge chambers for cooling the device. Savings on the purchase of chemical disinfectants and consumables. 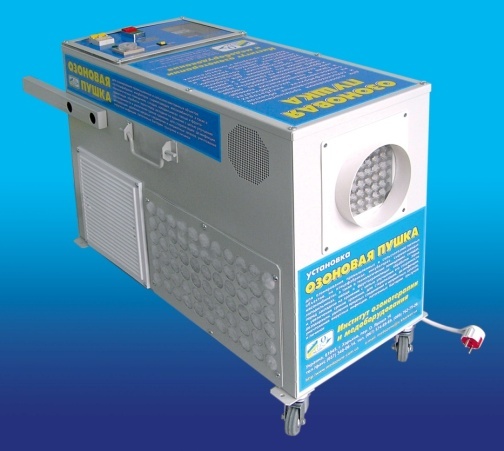 Within 15 years, the Institute of Ozone Therapy and Medical Equipment has produced and sold out ozone generators of different types and for various purposes in Ukraine, in CIS, Baltic States, Vladivostok, Kamchatka, Uzbekistan, Georgia, Azerbaijan, and in other countries.